Developed by WAGO for TOPJOB S rail-mounted terminal blocks these new connectors include models for large conductor sizes. Installed in the jumper slot, they function as pluggable power tap connectors for TOPJOB S 2006, 2010 and 2016 Series terminal blocks. The connectors now enable six terminal block lines to provide more than standard through connections. The new larger pluggable connectors connect sub-assemblies or test circuits, while providing power tap or power supply options for testing. 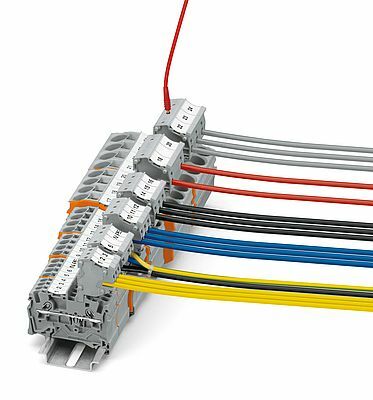 Custom connector strips can also be created by snapping modular connectors together. The connector range includes spacer modules that allow individual terminal blocks to be skipped within an assembly. An optional strain relief plate (734 Series) is available and can also be fitted upon completion of assembly. The new connectors for 10, 8 and 6 AWG (6, 10 and 16mm2) rail-mount terminal blocks offer a current rating of 32A and a rated voltage of 500V for conductors up to 10 AWG (6mm2).